A Tourist in New York: Busy Bustling City – Agnes' Sanctuary. A journey to inspire. It was Christmas Eve. We decided to have a wonderfully cold Christmas Eve under the Rockefeller Christmas Tree, watching ice skaters twirls around the rink. It was pretty even though it was packed. Most of them were tourists, like me, spotted by the flickering excitement in their eyes and their eagerness to took pictures despite of the crowd. One lucky thing about being small is that I can squeeze through them! We planned to get some shopping done the next day on Christmas Day, only to found out that almost everything was closed on 5th Avenue and Times Square. So, after taking some beautiful pictures of Manhattan from Top of The Rock and embracing the cold wind from up above, we decided to walk north towards Apple Store to see Central Park from the South. If you have time, you might want to walk the path and try to reach The Lake. We continued west trying to get to The Lincoln Center and The Juilliard School, hoping they would be open. At least to see what it was like inside. Sadly it was empty. It was one of my wish to visit Juilliard, being a violinist. From there we took Metro back to Times Square area and had a late lunch at Carnegie Deli. Supposedly it was the number 2 best deli in Manhattan after Katz Deli, which was a bit too far. It was humungous! Times Square was crowded although most of the stores were closed. I was about to take a picture when Minnie and Mickey Mouse twins showed up! Oh, just remember they expect some tips from you. Just like in Hollywood. Then we took Metro again to Brooklyn Bridge (or City Hall station) which allows us to walk to Brooklyn Bridge from the Manhattan side. What we did was to walk over until the first arch, took pictures and walk back. Hey, it’s still walking the bridge, right! 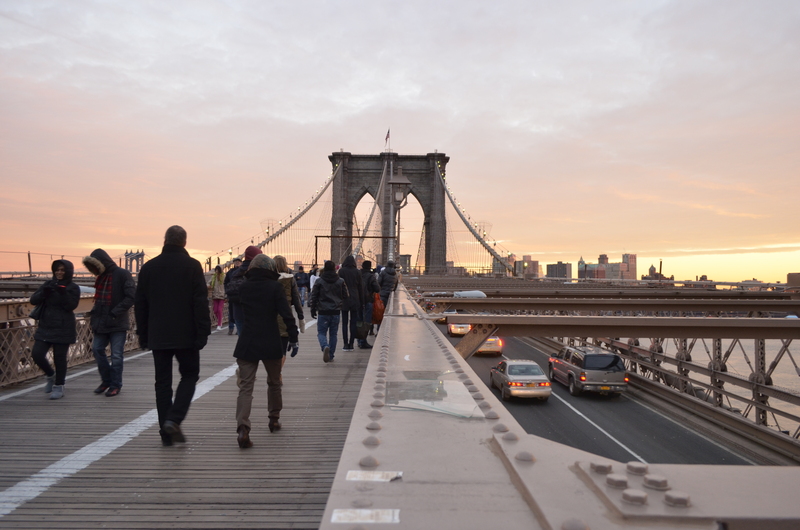 😀 If you want to cross the whole bridge then you might want to cross over to the Brooklyn side and walk back to Manhattan side. We walked to Chinatown from there, about 10 – 15 minutes away. We queued at Joe’s Shanghai who’s famous for its Xiao Long Bao (dumplings), but I guess being in an ice cold weather for more than half hour and still have about 30 people in front of us wasn’t worth it. So we move on, nothing much to see in Chinatown but we went back the day after for some Dimsum at JingFong. It was awesome considering we haven’t had any dim sum for several months. That morning on the 26th we went to Statue of Liberty, visited 9/11 Memorial which, again, was packed with tourists. We only reserved Liberty Statue with Pedestal tickets since tickets for the Crown was sold out. If you plan on going to the Crown, just remember that you’ll be climbing a few hundred step of stairs, and it might be steep for you. As for 9/11 Memorial, passes are free but you have to reserve to get a time and there’s a $2 non-refundable fee, or you’re welcome for a donation. The security measures on both places was similar to Airport security, so prepare time for that. We went to Bryant Park after lunch, where the skating rink is free with your own skating shoes.The place was also filled with small stores in cute little green houses selling all kinds of unique stuff. I was afraid not having enough time to grab some Wafels & Dinges when my friend pointed out they opened a stall there! OMG! One of the best waffles I’ve ever tried! Don’t get me wrong. There was a long line to get in this skating rink, as well as the one in Rockefeller Center. So be prepared to wait if it was on your bucket list. Walking from Bryant Park to 5th Avenue is easy. We went shopping for a bit before heading to 8th Avenue to Ippudo Ramen West Side, one of the best Japanese Ramen in New York. We were hoping to try some Cronuts at Ansel Bakery, ready tho figure out what the hype is all about. Sadly the line was super long and they said they’ll run out even before the line ends. Oh well, at least we still have a purpose that day. To try one of the first pizzeria in New York! Lombardi’s Pizza: not as good as expected, although it was really fresh. Then we continued a little shopping at SOHO, which in my opinion is a lot better than Times Square if you like a more relaxed and artistic environment. We woke up early on our last day at a sublet we found through Airbnb, packed everything and left the luggage in the room until we’re ready to check out later. Although the owner was extremely nice, not having hot water on some days after or before a cold weather outside can be a bummer. PS: Forgot to add that Levain Bakery has indeed the best cookies I’ve ever tried so far. It’s gigantic and heavy, crispy on the outside but the chocolate chip just melt in your mouth and the cookie itself tastes magnificent! They sell it online too, although more expensive than going to the store itself. Next What’s Stopping Us From Being Great? Us!